Free Case Evaluations any time. We have an experienced legal team with litigation experience and a history of getting our clients results. Contact The Freibott Law Firm, P.A. today for a FREE consultation to determine how we can get you the compensation you deserve. Call Us First! 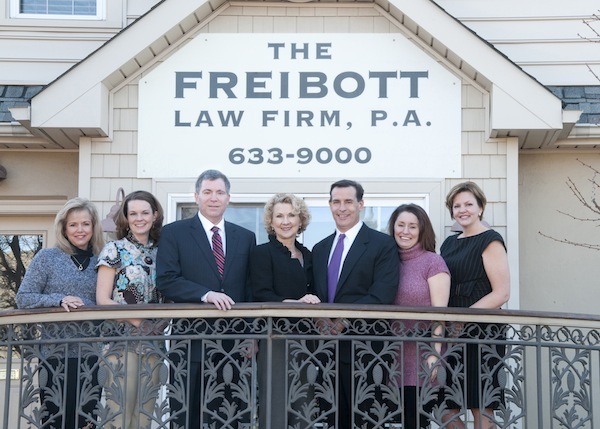 The Freibott Law Firm, P.A., located in Wilmington, Delaware is a full-service workers' compensation practice for the benefit of clients throughout New Castle County, Kent and Sussex County, Delaware. We represent injured workers and family members. ced Workers' Compensation Attorneys Injured workers in Delaware have rights if they are hurt on the job or while carrying out a work related activity. Those rights need to be protected. According to Delaware workers compensation law, employees who suffer a work injury may be entitled to benefits and financial compensation for their injuries, lost wages and medical costs. Having a Wilmington Delaware, workers' compensation lawyer on your side will give you peace of mind knowing that you will get all benefits you deserve. The Newark Delaware workers' compensation attorneys at The Freibott Law Firm, P.A., located in Wilmington, Delaware is a full-service workers' compensation practice for the benefit of clients throughout New Castle County, Kent County and Sussex County, Delaware. We represent injured workers and family members of deceased workers. Call (302) 633-9000 for a free consultation with our award winning Wilmington, Delaware workers compensation lawyers. Workers' Compensation Benefits Our Newark Delaware workers' compensation attorneys pursue all available forms of workers' compensation benefits for our clients. These include: Medical benefits:Under Delaware workers' compensation laws, injured Delaware workers are allowed to see a doctor of their choice. They also have a right to have all necessary medical services covered. Lost wages: Those hurt at work in Delaware may be entitled to lost wage compensation. Our Newark workers compensation lawyers will help you seek benefits for temporary total disability and temporary partial disability. Please see our Delaware workers' compensation benefits page to learn more. Disfigurement:Delaware workers' compensation laws provide compensation for workers who have suffered scarring or disfigurement as a result of a work-related accident. Please review our firms scarring and disfigurement benefits page to learn more. Death benefits:If a worker is fatally injured in a Delaware workplace accident, that person's family has a right to pursue death benefits. We handle death benefits claims and survival claims on behalf of clients. Permanent impairment:If you have suffered a permanent impairment, such as a loss of limb or permanent damage to your neck, back, arms or legs, you may be entitled to receive permanent impairment benefits. Visit our page on permanent impairment to learn more. Hard work, Compassion and results. Frederick Freibott: Recognized by his peers and Delaware Today Magazine as a top personal injury attorney. Let him work for you today. Connected to the community. As a native of Delaware, Mr. Freibott graduated from a local high school. The son of two teachers with over 65 years of teaching experience, he knows the importance of education and dedication to his community. Mr. Freibott understands the importance of working hard for his clients to obtain the best possible results. He earned his college degree at Gettysburg College and his law degree from The Widener University School of Law. He is a member of the Delaware State Bar Association and the Delaware Trial Lawyers Association. Recognized by his peers. Mr. Freibott was recently voted by his peers as one of the top personal injury lawyers in the state of Delaware and has been accepted as a life member of the National Registry of WHO'S WHO. Married in 1990 to his wife Elaine, Mr. Freibott has two children.